For the first time ever, Meal Exchange and Food Secure Canada have partnered to bring their National Conferences together in Montreal this November. This is intended to amplify student and youth engagement in the food movement and build relationships between students and members of the broader food system. Meal Exchange’s National Student Food Summit brings together student leaders from campuses across the country to learn about campus food systems, build networks with passionate student leaders, strategize to bring an end to student food insecurity and develop tangible skills to carry out this work on campus. 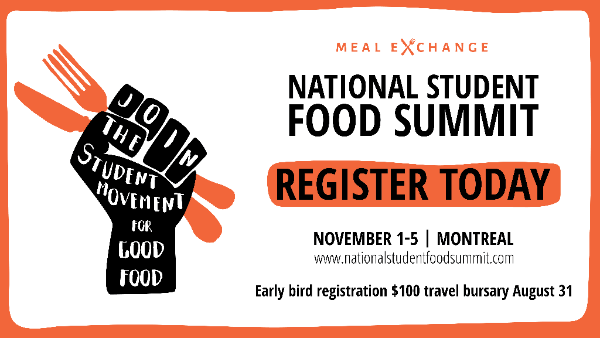 The National Student Food Summit will take place one day before (November 1st, 2018) and one day after (November 5th, 2018) FSC's Assembly. For more information, please visit Meal Exchange Canada's website.